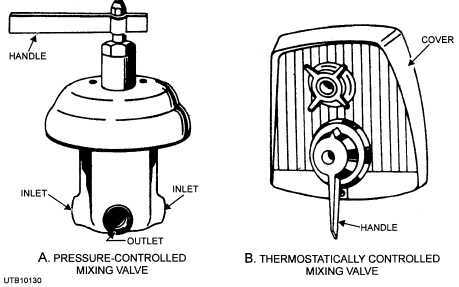 Home > Construction Training Manuals > Utilitiesman Volume 01 > Figure 5-28.Shower Mixing Valves. Figure 5-27. - Bathtub and shower piping arrangement. sudden changes of temperatures due to slugs of hot or cold water from varying pressures or water temperatures in the supply lines. The pressure-controlled mixing valve, like the one shown in view A, figure 5-28, consists of a brass mixing chamber that contains a sliding piston. The piston has jets to allow hot and cold water to pass through them and mix when the handle of the valve is operated. The setting of the handle controls the water temperature by establishing the mixing ratio. A change in pressure on one side of the piston causes the piston to move and increases the flow from the low-pressure supply to maintain a nearly constant pressure. The thermostatically controlled mixing valve, similar to the one shown in view B, figure 5-28, is sensitive to changes in both temperature and pressure. 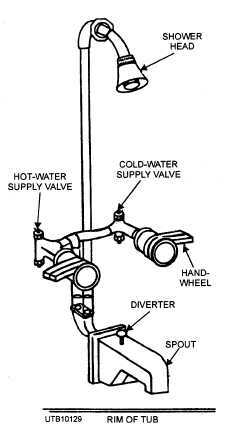 The temperature of the water delivered by the valve remains constant regardless of the temperature and pressure changes in the hot and cold waterlines. The thermostatic mixing valve is used for showers only. Figure 5-29. 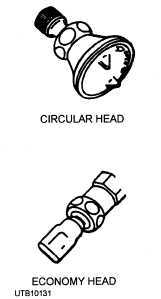 - Types of shower heads. Figure 5-28. - Shower mixing valves.